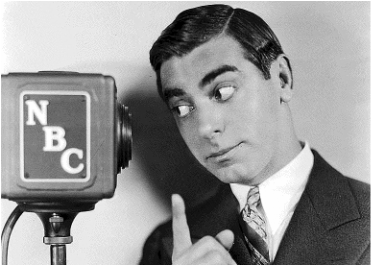 EDDIE CANTOR REPEATS AS NUMBER ONE IN THE RATINGS. What Depression? The Depression was taking its toll in 1933 and advertising was in a slump.- total ad spending in all media had plunged 57% since 1929. In sharp contrast, Network Radio revenues had grown 64%. The networks‘ 1933 income decline - a hefty 19.4% - was just a bump in the road that would lead to annual billings of over $100 Million by the end of the decade. Newspaper and magazine publishers were incensed by Archibald Crossley’s ratings that the networks happily shared with advertisers and their agencies every few weeks. (1) Ratings gave broadcasters quantitative sales ammunition that buyers could compare to the printed media’s circulation figures and justify taking the plunge into the new medium. Like these three series, music was the major element in 28 of the season’s Top 50 programs - an all time high for the Golden Age. All five of the season’s most popular programs, eight of its Top Ten and 21 of the Top 50 were vaudeville-like variety shows mixing liberal doses of music and comedy. It was obvious that listeners wanted to sing and laugh away their Depression-era troubles and Network Radio was eager to help. Chasin’ Sanborn’s Cantor. Standard Brands ruled radio popularity with two of the season’s Top Three shows and three in the first eleven. Eddie Cantor’s top rated Chase & Sanborn Hour raised eyebrows with a 53.7 average Crossley rating for the season, peaking at 57.2 in December, 1933. Given the estimated 19.25 million radio households at the time, the 53.7 rating infers that Cantor attracted an average audience of over 25.8 million listeners every Sunday evening. Meanwhile, Standard’s other established hit, Rudy Vallee’s Thursday night Fleischmann Yeast Hour, registered an impressive 39.8 rating for the season - the highest rating Vallee would ever achieve and good for third place. His show was also the launching pad for Fleischmann’s newcomer to Sunday’s Top Ten, Joe Penner’s Baker’s Broadcast. The Bakers’ Broadcast was aired under Fleischmann’s banner from Los Angeles on Sunday nights at 7:30 on Blue, immediately prior to Standard’s top rated Chase & Sanborn Hour on NBC. Penner, supported by Ozzie Nelson’s band and singer Harriet Hilliard, (two years before their marriage), started the season slowly with a mere 10.0 rating in October. But his silliness spread quickly and by February Penner enjoyed cushy numbers in the 30's, on his way to a season’s finish in eleventh place. Attention, Shoppers! Thursday was Network Radio’s most popular night in the 1933-34 season. But more skepticism was aimed at Crossley’s ratings when General Foods’ Maxwell House Showboat jumped a whopping 46% to second place in the 1933-34 rankings. However, the Thursday night leader with its 44.6 rating signified a brief trend. For the first and only time, nine shows featuring standard and traditional melodies of the past led the category of programs devoted exclusively to music - possibly providing a wave of “good old days” nostalgia among listeners. National Dairy Products, aka Kraft Foods, joined General Foods and Standard Brands with its own hour long NBC variety show on Thursday night - the eve of American housewives’ traditional Friday food shopping. Kraft made Velveeta plus a variety of processed cheeses and introduced Miracle Whip salad dressing at the Chicago Exposition of 1933. Its Phenix Foods division produced Philadelphia Cream Cheese. Paul Whiteman’s Kraft Music Hall - aka The Kraft-Phenix Program - featured Al Jolson for twelve weeks of its 42 week run in 1933-34. Jolson’s four appearances in September, at $5,000 each, ($91,800 in today‘s money), spiked the show’s ratings with a season high 33.2. Nevertheless, Whiteman, whose entire group was paid $4,500 a week, delivered solid ratings in the 20's without Jolson. Their high ratings set the pace for Kraft Music Hall which would finish among the Top 15 shows over the next eleven consecutive seasons and in the annual Top Ten for six of them. Will Power. Gulf Headliners was radio’s most schizophrenic variety show - featuring one major star and three guest hosts. Headliners’ true headliner was Will Rogers, who debuted on the series in May, 1933, and returned a 37.8 rating - but he was also working on three movies a year for Fox. To cover his absences in the 1933-34 season, Gulf Oil enlisted a trio of substitutes for the Sunday night show on Blue that can only be described as eclectic. Vaudeville veteran Fred Stone and his singing daughters hosted Gulf Headliners in September and October. Stone was Rogers’ closest friend and namesake of the humorist’s first born son who died in infancy. The Stone family act averaged a respectable 17.2 rating for the two autumn months. Rogers took the show in November and Headliners’ rating more than doubled to a 38.6. Legendary song and dance man George M. Cohan, 55, followed in December and the rating fell 15 points. Rogers came to the rescue again in January and February with a 39.5 average - an excellent promotional lift for his movie David Harum which was released in March. Cohan kept less than half of Rogers’ audience with a 17.7 March and April average. Songwriter Irving Berlin’s one month Headliners appearance in May sank to 13.7. Rogers demonstrated his drawing power again when he returned to close the season in June and the show’s rating rebounded to 30.7. Paley’s First Team. Burns & Allen continued on their ratings roll begun with Gracie’s “missing brother” stunt of the previous spring. Their popularity was further pushed along by their appearance Paramount’s musical, College Humor, released in July. George and Gracie enjoyed their second Top Ten season and a 28.2 rating, the best they would ever achieve. Again teamed with Guy Lombardo’s orchestra, they gave CBS its first Number One show of any night. Ironically, the win was a mixed blessing for the CBS boss Bill Paley. Burns & Allen’s sponsor was General Cigar, the biggest competitor to the Paley family’s Congress Cigar Co. The Little Theater Off Lake Michigan. It was a backsliding year for radio drama. Half of the previous season’s 14 dramatic series dropped out the Top 50, leaving just five anthologies and two scripted dramas with continuing characters. An exception to the downtrend was First Nighter, which jumped from Blue to NBC, registered a 35% gain in audience, became the year’s top rated dramatic series and moved into the annual Top 15 for the first of five consecutive seasons. First Nighter’s weekly opening created the illusion of originating from New York’s “Little Theater Off Times Square.” In reality, it was over 700 miles off Times Square. The program originated from Chicago for its first 16 years and then moved to Los Angeles. The series of light romantic comedies with an occasional melodrama was sponsored by Campana Balm - an “Italian” hand lotion manufactured in Batavia, Illinois. Campana’s sponsorship of the program began in 1930 and continued for 19 years over all four networks - a record for sponsor/program longevity. Baker & Benny Build. Phil Baker’s Armour Jester rating shot up 48% in its 9:30 Friday timeslot on Blue to a season average of 23.9. It was the highest rating the accordion playing comic would ever register in his twelve year network radio career. The Jester format involved a butler, a singer and a heckler who continually put down the star. Baker’s self-deprecation shtick resembled Jack Benny’s which was slowly developing. Benny settled on NBC for the season but continued to bounce around different timeslots. After six months on Sunday night for Chevrolet, Benny was shifted to Friday nights under General Tire sponsorship. Singer Frank Parker and announcer Don Wilson joined Benny’s wife - aka Mary Livingston - in support. Benny’s "butler" and most famous sidekick, Eddie Rochester Anderson, was still four seasons from his first appearance. Byrd Calls. CBS gave listeners a true reality show on Saturday nights. With a buildup that started with the launch of Admiral Richard Byrd’s Antarctic expedition in October, 1933, the network began a two-year series of live programs via shortwave from Byrd’s ship in December and his headquarters at Little America in February. It was a unique variety show with members of Byrd’s crew providing music, CBS staff announcer Charles Murphy reporting news of the expedition and Byrd contributing commentary about the group‘s adventures in the sub-zero wasteland. Public curiosity about the expedition propelled the program into 26th place in the annual rankings and provided an effective launching pad for a new line of products that General Foods had begun marketing - Birds Eye Frozen Foods. Seth Sets Sail & Sinks. Inspired by the hoopla created by the launch of Admiral Byrd’s expedition, Phillips H. Lord abandoned his Sunday At Seth Parker’s hymn sing and its double digit ratings in October. He had a more adventuresome idea for NBC. With the backing of sponsor Frigidaire refrigerators, Lord bought a seaworthy four-mast schooner, renamed it The Seth Parker, announced plans for a globe circling cruise and proclaimed that he, too, would shortwave tales of his adventures back to “the folks at home” every week. Every week the Ship of Joy “sailed” from “Good Cheer Dock” and cruised to the “Isle of Happiness,” with music provided by Horace Heidt’s orchestra. During each “voyage” Dobbs urged his studio and home audiences to think hard and transmit good wishes to sick and troubled friends. As maudlin as it sounds, Ship of Joy developed a loyal following and generated enough ratings for a Top 50 finish before Del Monte sank it after one season. NBC increased its lead among the networks with 26 of 1933-34’s Top 51 programs, (three tied for 49th place). Blue moved up to second place with 14 programs and CBS trailed with eleven. (1) Crossley obtained funding from the Association of National Advertisers, the American Association of Advertising Agencies and the National Association of Broadcasters in 1934 to form the Cooperative Analysis of Broadcasting (CAB) polling firm. (2) The schooner Seth Parker sailed on until it was sunk in a south seas gale which newspapers delighted in debunking as a publicity stunt. Phillips H. Lord survived both the scandal and the sinking to later create the Network Radio hits Gangbusters, We The People, Counterspy and Mr. District Attorney. (3) Four years later the Zenith Radio Corp. sponsored its Zenith Foundation dramas on Blue and CBS without commercials, relying instead on listeners' extrasensory perception to receive its sales messages. The program was cancelled after 26 weeks. Crossley Broadcast Advertising Report, Sep 1933 - Jun 1934. Total Programs Rated 6-11 PM: 161 Programs Rated 13 Weeks & Ranked: 123. Previous season ranking is noted in the second column. N indicates New to the Top 50.